1 Match strength with strength. Pair delicate dishes with lighter craft beers and strongly flavoured dishes with intense, more assertive beer styles. 2 Use the dominant flavour or ingredient in a dish as the starting point. Hops are very food- friendly and will go with just about any food. 3 Supporting ingredients – herbs, spices, fat and sugar - impact on the interaction of the beer with the food. 4 Consider what cooking methods and techniques to use because this affects the end result. Grilling, roasting, smoking and baking when done at high temperatures will accentuate the beer’s malt flavours, while braising or frying adds fat that will coat the palate and protect against the ‘bite’ of the alcohol. 5 Hops can mimic the flavours of herbs and spices. Hops with herbal, spicy, pine, citrus, tropical, fruity or woody flavour notes will compliment similar herbs and spices used in the dish. 6 Yeast can also compliment a wide range of supporting ingredients and flavours. 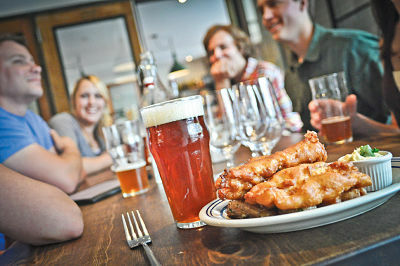 There are three main interactions with beer and food pairings – complementing, contrasting and cutting. For a dish to be complementary you’re looking for harmonious flavours between the ingredients and the craft beer e.g. roast duck breast with a brown ale or Dubbel or the light acidity of a witbier with a salad and vinaigrette dressing. Roasting or grilling will complement the malts used in the beer and bring out the Maillard reaction. Contrasting is the most challenging interaction on the palate and works best when the dominant flavour of the dish contrasts against the main flavour profile of the beer e.g. sweet v sour or bitter v sweet. A classic example is the tropical flavour notes of an American IPA with an intensely, hot pepper spiced dish or curry. Craft beer cuts through the fat of rich, succulent and creamy foods to cleanse the palate after every mouthful and leave it feeling refreshed, clean and ready for the next bite. The bitter strength and astringency of hops lifts fat from the palate and a sweet finish cuts away acidic flavours, leaving a pleasant sensation in the mouth. Sour and tart flavours can cut away sugary and fruity notes and the scrubbing effect of carbonation diffuses the richness of the food. Crisp & Clean Beers – these beers are refreshing, delicate and slightly dry and work well with lighter flavours. Pair with grain based dishes such as creamy risotto, salads, vegetable. Beer styles: Blonde Ale, Pilsner, Helles, Kölsch. Hoppy & Bitter – great with foods that need a bit of competition on the palate, think spicy, fatty or acidic. The bitterness of hops lifts fat from the tongue leaving you ready for the next bite. Hops can be intensely flavoursome with notes of citrus, resin, tropical fruit or pine, herbal or floral. Beer styles: Amber, Barley Wine, IPA, Imperial IPA, Pale Ale. Try with: spicy foods, curry, pizza, cheese, carrot cake. Malty & Sweet – offer a degree of sweetness and notes of nuts, toffee, caramel and dried fruit from roasted malts. These beers complement food that is roasted, crispy or browned. Beer styles: Amber lager, Brown Ale, Belgian- style Dubbel, Dunkel, Scotch Ale. Goes with: roast chicken, pork, duck, sausages, cheese. Rich & Roasty – intensely deep, dark, rich flavours; barrel-aged bourbon, vanilla, chocolate, coffee and sometimes a smokey aroma and work with dishes that have roasted fat such as nuts, red meats or chocolate. They’re great with anything charred, barbecued or grilled or anything with a clean, briny finish such as oysters. Beer styles: Brown Ale, Stout, Porter, Schwarzbier. Pair with: ribs, burgers, meat casseroles, barbecue, spicy foods, oysters, chocolate. Fruity & Spicy – flavours are mainly driven by yeast and can include notes of stone fruits, citrus, ginger and salt or banana, clove and hay. Spicy aromatic foods that go well with rose or red wine would be good accompaniments here. Beer styles: Belgian Blonde Ale, Witbier, Hefeweizen, Saison, Tripel, Quadrupel. Works with: shellfish, seafood, fish and chips, sushi. Food suggestions: creamy desserts, cheesecake, crème brulee, Black Forest gateau. The Brewers Association defines a craft brewer as being small, independent and traditional. Small: Annual production of 6 million barrels of beer or less (approximately 3% of US annual sales). Beer production is attributed to the rules of alternating proprietorships. Independent: Less than 25% of the craft brewery is owned or controlled (or equivalent economic interest) by an alcoholic beverage industry member that is not itself a craft brewer. Traditional: A brewer that has a majority of its total beverage alcohol volume in beers whose flavour derives from traditional or innovative brewing ingredients and their fermentation. Flavoured malt beverages (FMBs) are not considered beers. The Brewers Association (BA) is the not-for-profit trade association dedicated to small and independent American brewers, their beers and the community of brewing enthusiasts. The BA represents 4,000-plus US breweries. The BA’s independent craft brewer seal is a widely-adopted symbol that differentiates beers by small and independent craft brewers. Further details and recipes are available in my new book ‘The Beer Pantry’ (Dovetail).